We just stopped in a small village when we saw this tiny hedgehog move towards the busi main road and cars were coming up fast. 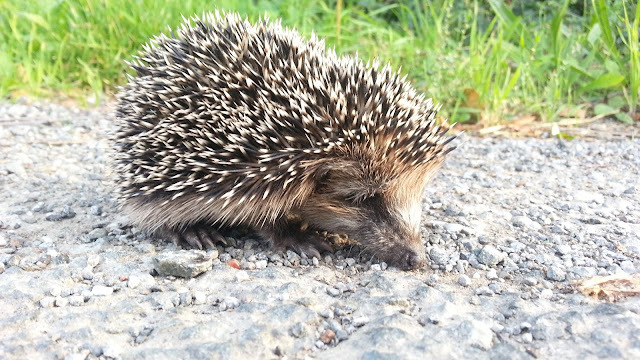 I stood in the road - just on the side - so that the cars would see us and not hit the hedgehod. Then I used a calm moment to snap a few shots of him. He seemed nicely calm. We then picked him up with a tshirt for padding and carried him across the road and into a field on the other side. We hope that this saved him and he had a great time in the field. It seemed to us that he was headed there when we encountered him.